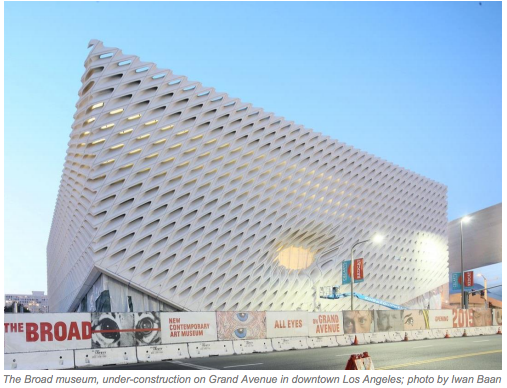 The long anticipated opening of The Broad Museum is finally happening this Sunday, September 20. For the first time in its 40-year history, the postwar and contemporary art collection assembled by philanthropists Eli and Edythe Broad will be shown to the public in its most comprehensive installation. 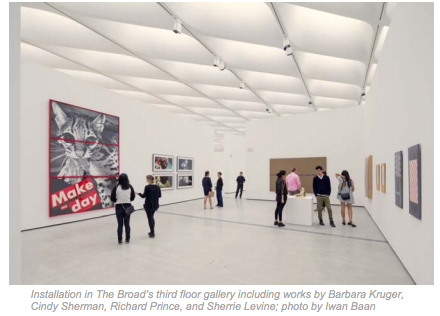 The inaugural installation at The Broad’s new landmark building on Grand Avenue in downtown Los Angeles will feature a sweeping, chronological journey through its contemporary art collection that has never before been possible in such depth. Founding Director Joanne Heyler, who is curating the inaugural installation, has selected more than 250 works—by over 60 artists including Jasper Johns, Robert Rauschenberg, Ed Ruscha, Andy Warhol, Roy Lichtenstein, John Baldessari, Mark Bradford, Jeff Koons, Barbara Kruger and Kara Walker— that best represent the Broad collection’s view of a half century of contemporary art. The three-story museum, designed by architects Diller Scofidio + Renfro in collaboration with Gensler, features 50,000 square feet of exhibition space on two floors. The inaugural installation will begin on the third floor, with its soaring 23-foot-high ceiling, filtered natural light and 35,000 square feet of column-free gallery space, giving visitors a constant and unobstructed view of the 318 skylights overhead. The third-floor installation presents a chronological journey from the 1950s through the 1990s, punctuated throughout by single artist galleries. The installation will begin with classic 1960s works by Andy Warhol, as well as a luminous gallery of Cy Twombly painting and sculpture, and will track the Broad collection’s strengths through the decades. The installation continues in the first-floor galleries, bringing the journey through contemporary art to the present with some of the most recent acquisitions and artworks such as Yayoi Kusama’s immersive Infinity Mirrored Room – The Souls of Millions of Light Years Away and a colorful, epic 82-foot-long painting by Takashi Murakami, a meditation on the recovery of Japan from the catastrophic 2011 Tohoku earthquake and tsunami.